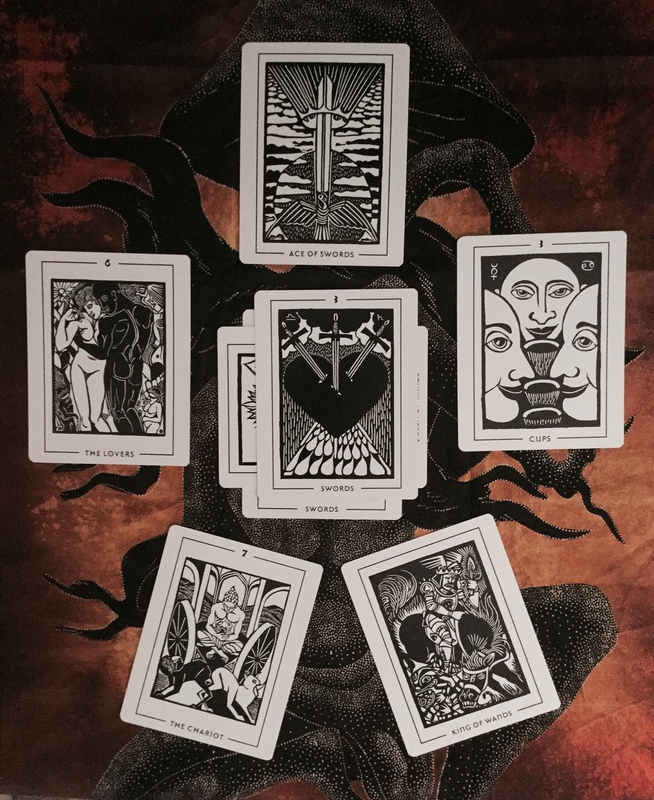 As a veteran Tarotist and deck collector, it is always exciting to see a new deck, especially one that advances on or adds to the possibilities of purpose and use. The Story Prompt Cards by Tea Silvestre Godfrey is just such a deck and I couldn’t wait to get my hands on it. There is much to explore and learn, so this is simply a first pass, but assuredly more spreads with this deck will be shared. And, as a Narrative Strategist, the focus and purpose of this deck couldn’t be more intriguing. In a narrative consultation questions are asked to specifically reveal a person’s own true story, the one they are authoring – not the story written for them by others, the culture, other social constructs, or an outside expert. Solutions are found by unearthing one’s personal story and editing it based on the querent’s mission and values. I have long used the Tarot as a tool for this type of story exploration so the “Story Prompt Cards for Business Storytellers” will no doubt by a wonderful new tool. Presented below is a first attempt at using these cards in a Pentacle Spread format, rather than the longer form Celtic Cross. I’ve also included a much shorter version of the same reading, done after the Pentacle; a Past-Present-Future spread. I hope you find it as interesting as we did. As a corollary to the Prompt Cards I will be using the Light & Shadow Tarot for which I wrote 78 incantations (poetic verses) for the cards of the deck. Those meanings will appear in parentheses after each prompt card question/meaning. I want to see if this new approach can be further amplified within the context of a Pentacle Spread reading informed by the LS Tarot. Not because the prompts/questions aren’t enough … by no means. By using the tarot spread we can reduce some of the randomness of selecting a card and running with it. Here, when a prompt card falls in a particular position on the pentacle it fine tunes exactly what part of that question to really dig into deeper – within the context of physicality (earth), ideas (air), action (fire), intention (spirit), & emotions (water). this adds additional layers to and already rich story. The conversation was long as we delved into each pentacle point, much too long to record here. These are the highlights. Querant: Small family business owner concerned about how his business will move forward. NOTE: For an effective reading it is important to pose a question that will yield not only insight but action items as takeaways. I encourage “How” questions as they almost always provide both insight and a course of action. This card asks to explore and focus on how he presents himself, his business, how he leads with his words, how he is the captain of his ship, an expert in his field. (LS Meaning: The locusts have devastated your crops, but perseverence and faith will get you through to an even greater harvest). The challenge is to look at your reputation, and recognize the good works that you and the team do…then how do you get the word out. (A down to earth, common sense person, who doesn’t need to prove himself.) This was an ah-ha moment to think about how this point of view, which he agreed he held, was getting in the way. Proving himself is a deep personal struggle we uncovered. When have you thought outside the box? And, how was that for you? Interestingly he has a daughter who he currently doesn’t see as a likely successor. The Princess of Swords in the LS deck represents a wild young woman (think Burning Man type Bohemian) – BUT, all her emotions and behaviors are rooted in an unconventional, non-traditional wisdom that is often overlooked or dismissed. Fascinating! The Present card (center) is the challenge, the past (left) refers to his approach to process, and the future – the daughter with a new perspective. So what did he get out of it? What’s his plan? Knowing that his daughter would whole heartedly support the team donating time to a Habitat for Humanity project, he will partner with her to spearhead the effort. A time to bond with her in a new way and to dig deeper into how she sees the future of the business. Also, this will give the team and the company an opportunity to develop new relationships within and outside the business, promote a good cause that they can share as an experience and outward gesture of community service. Above all, it will create a new way to be a team together that may increase morale and inspire new vigor to press ahead to the success that is sure to come with their hard work. In the same way that Helen Palmer, brought the Enneagram out of esoterica into the western modern age (e.g. The Enneagram in Love and Work: Understanding Your Intimate and Business Relationships), Silvestre-Godfrey has re-fashioned tarot principles and wisdom for the business world and brand storytelling. Quite an accomplishment and kudos are due Tea for her marvelous deck. What’s especially wonderful about the Story Prompt Cards is the variety of stories it coaxes out of folks when it comes to their businesses and how they work in or run them. Imbued with the energy of the tarotic structure they carry a great deal of historical, alchemical insight without the esoteric imagery and symbolism. This new deck provides an opportunity for those less familiar, or uncomfortable with oracle divination, to access the great power of the Tarot. Just like with the Tarot, one card is good, but the more you add and provide context for, the deeper the dig into the dynamics of the current situation and the greater opportunity to discover concrete, tangible solutions within a self-generated story. Best yet, due to the innate nature of the narrative consultation, solutions are authored by the querent rather than an outside “expert”. The power of one’s own personal story and insight far surpasses that of an observer, wouldn’t you agree? I would love to hear your thoughts, so don’t hesitate to share them. Below is the same Pentacle Spread with the Light & Shadow Tarot cards corresponding to the Story Prompt Cards. If you are interested in further exploring your story and solutions within a narrative context, whether with the Light & Shadow Tarot, Thoth, Secret Dakini, or the Story Prompt decks, please do not hesitate to contact me. Peace. This was amazing. Thank you for sharing this process with us. And for sharing my deck. Completely honored over here.